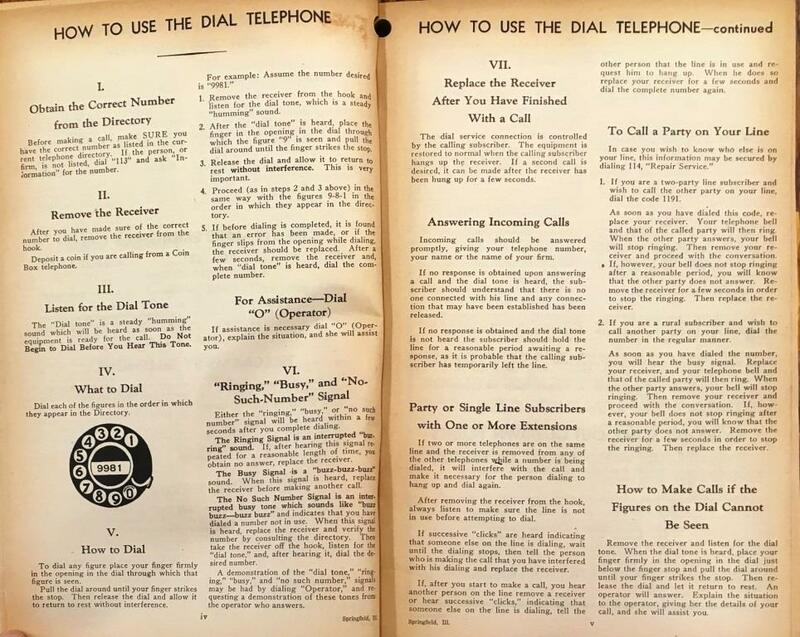 Six hundred dial telephones were put into service at the Illinois Statehouse in March 1934, the first use of dial technology anywhere in Sangamon County. However, no one in the Capitol could dial a phone outside the building for nearly two more years. The 55 telephone customers in Cantrall got dial-up service on Dec. 4, 1936, followed the next day by users in Riverton (110 phones), Mechanicsburg (71), Buffalo (170) and Rochester (56). Previously, local calls were made using one of two different systems, both of which routed calls through operators. In the most basic version, a caller simply lifted the receiver off the phone hook, and the operator answered. Other phones had magnetos; those callers signaled the operator by turning a crank. In both systems, the caller either told the operator the number he or she was calling (Springfield had two exchanges, Main and Capitol; numbers were four or five digits long) or gave the name of the customer being called. The operator then made the connection. “All subscribers on the line have equal rights; for that reason calls should be reasonably limited in length of conversation,” the directories reminded. The switch to dial service was simple to carry out for the smaller communities; phone directories included instructions for dialing. Springfield, however, had 14,500 phones in use in 1939, when the change took place there. That took more planning, more consumer education, and a new phone book. Subscribers even got personal demonstrations, the Illinois State Journal reported on June 25, 1939. The last step in preparing its customers for dial telephone service will begin tomorrow when the Illinois Bell Telephone Co. will send out forty especially trained young men to visit the premises of telephone subscribers to demonstrate the use of the dial. These young men, all residents of Springfield, will visit more than 14,500 premises throughout the city and will demonstrate for the subscribers and all members of the household or business the correct way to use the dial telephone when it is put into service in August. At the same time, they will test the telephone equipment and insert a new number plate in the telephone instrument. 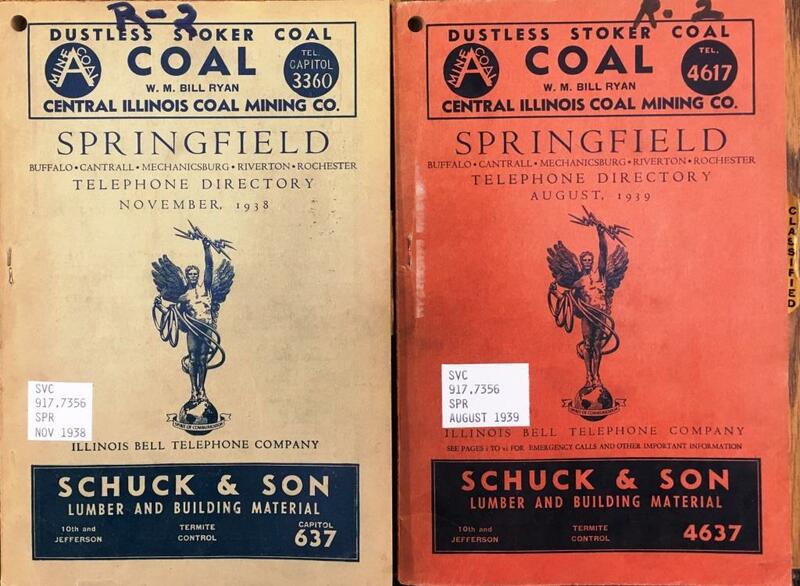 Springfield phones were converted to dial service at midnight Aug. 19, 1939. The new system, however, also required that all phone numbers be changed, which also involved abandoning the Main and Capitol prefixes. That, in turn, meant a new city phone directory, one with a red cover (and two pages of instructions on how to use a dial phone) instead of the previous gray. The switch apparently went smoothly, although labor unions pointed out that the combination of the new dial system, as well as Illinois Bell’s introduction of coaxial cable for phone lines – coax allowed many more calls to be carried on a single line – would cut company employment. One union leader told the Springfield Federation of Labor that “over two hundred girls in Springfield would lose jobs” as a result of the changes. The federation called on the company to reduce rates because of the savings; if that happened, however, the Journal seems never to have mentioned it.